Hi everyone, this is Evan's birth story. 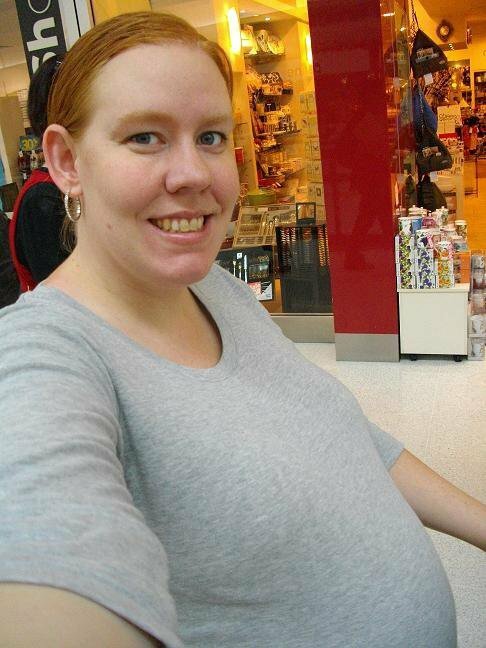 Evan did NOT have a "normal" birth, therefore I won't sugarcoat what happened to him and to us his parents. I've included pictures of Evan during his time with us and some of us with him after he died. This is what happened, no details spared, so if you have a bit of a squeamish stomach, I suggest you not read this. Side note, I do not blame any of the medical professionals involved with for Evan's death. As Evan's NICU doctor explained (paraphrased) "this was one of those unexplained flukes and without any warning you would never have known he was backwards. You did what you could and it just didn't work out. From what you've told me about your pregnancy I can't see any reason that would have led to him turning. He just did." One of the last pictures of me while pregnant with Evan - 37 weeks 5 days. I woke up with a funny feeling in my stomach. It was June 18th, our baby boy’s due date. My stomach felt like it was a giant rubber band being stretched for 10-15 seconds. It went away and I tried to get back to sleep. 10 minutes later another one hit. I knew instantly these weren’t Braxton Hicks contractions, but the real deal. I got up, went to the bathroom (it felt like I couldn't stop pooping, small wonder as my body was clearing itself out in preparation for baby’s arrival) and sat there for another cycle and knew I wouldn’t make it back to bed any time soon. 7am I called my mother in law, my mom, my dad and my neighbor (who was my lift to the hospital if I needed it). I called the hospital and asked what I should do as my contractions were starting to hurt and I had to grit my teeth and breathe hard to cope with the pain. The midwife on the other end said to clock myself and to call back when my contractions were harder and closer together. I "could come in but they’d most likely send me home to wait it out". I started to count how long my contractions were (easily 20-25 seconds every 6-8 min now) and at 7:30 I felt and saw my mucus plug come out. I called the hospital back at 7:30am and they said to keep clocking myself as it sounded like I was still in really early labor. The new midwife I talked to (shift change happened since I last called) told me to take 2 panadol (acetaminophen), have a light breakfast and take a warm shower if I wasn’t coping with the pain. I hung up, got myself to the kitchen to get some panadol and a cup of water and immediately had to get back to the toilet because another contraction came. I took the two painkillers and drank the water at about 7:45. Two minutes later my contraction was 30-35 seconds long and I had to hold onto the doorframe and try not to scream. I knew something wasn’t right! I felt another one coming on and knew that this wasn’t normal. Something was up and my little guy was in distress. I heard and felt a huge “pop”. It was my baby boy’s foot. A split second later my waters broke. I hollered: “Glenn I need you down here!” I heard “I’m in the loo". I *SCREAMED* and heard the toilet flush and my husband running down the stairs. I told him to dial 000 (Australia’s version of 911) now. He asked if he should call the hospital. I said “No, don’t call the hospital, call 000 NOW!” He did, the operator asked all sorts of questions and I was handed the phone to answer them. I told the operator something was sticking out of me and he had my husband check to see that it was a foot. It was. Paramedics arrived within 3 minutes of my husband dialing. Thank God for such quick response time! 7:55amThe paramedics arrived in 2 ambulances. One for me, one for Evan, just in case. They got me off the toilet and onto my hands and knees so I was on a floor rug instead of the cold tile floor. They asked all the questions they needed to, put me on oxygen which was more of an annoyance than a help so I had it taken off me. 3 of the 4 guys were crowded behind me and said “We’re here, we’re going to try to deliver him at home. If you need to push, tell us and PUSH. Don’t hold back…” In between trying to crawl forward to give them some more room and breathing through another contraction our baby’s 2nd foot came out. He was out from his belly button on down. The paramedics couldn’t get Evan into the right spot to deliver at home so the decision was made to get me onto the gurney, STAT! Roughly 8:30am It took a few minutes to get from our laundry room floor to the dining room (all of 10 feet, if that) by crawling. One guy had our baby boy’s legs and half of his torso wrapped up in space blankets and towels. One guy had me, another had the foot of the gurney, another had the head of the gurney. My husband grabbed my hospital bag and my purse. I was carefully loaded into the ambulance and my husband locked up the house. One guy left in the 2nd ambulance as his wasn’t needed. My husband rode shotgun while 2 guys were attending to me and baby Evan. Roughly 8:40am We'd arrived at the hospital less than 10 minutes later and were draped with a blanket so the emergency room patients wouldn’t see half of a baby sticking out between my legs. Being on hands and knees still, I was wheeled into the Emergency Department (not even a labor and delivery room, although one was set up for me, as well as an OR on standby) where we were met with atleast 20 people or so my husband tells me. 8:50am I remember I'd raised one hand, did a beauty queen wave and said something like “Good morning, thought we’d give you an interesting call first thing this morning…” It’s amazing how much you keep your wits about you and distract yourself any way possible during a crisis. The head of midwives/birthing (Hilary) introduced herself and said “Now we have one more undignified thing for you to do… we need to get you from your knees onto this gurney and onto your back. We’ve got bubby just take it easy and we’ll roll you over.” I was in heaven! Finally off my knees and onto my back! A swarm of people introduced themselves, gave me their title and asked if I was allergic to anything. Then they gave me a cannula (never had to use it), they gave me some shots (oww), they told me that the doctor was delivering our baby boy. I think I screamed for my husband and he was instantly at my side and holding one of my hands. Dr. Basu (the breech birth specialist that happened to be on-call that day) twisted Evan’s shoulders out one at a time while Hilary pressed on my stomach to get Evan’s head and chin facing down and Evan was born. It was 8:55am. Evan was 7 pounds 14 ounces and 22 inches long. Full head of dark hair and lovely gray eyes. Dr. Basu, the OB on-call, held Evan up for a second and my husband saw his little boy. I was too busy feeling like a million bucks to look. 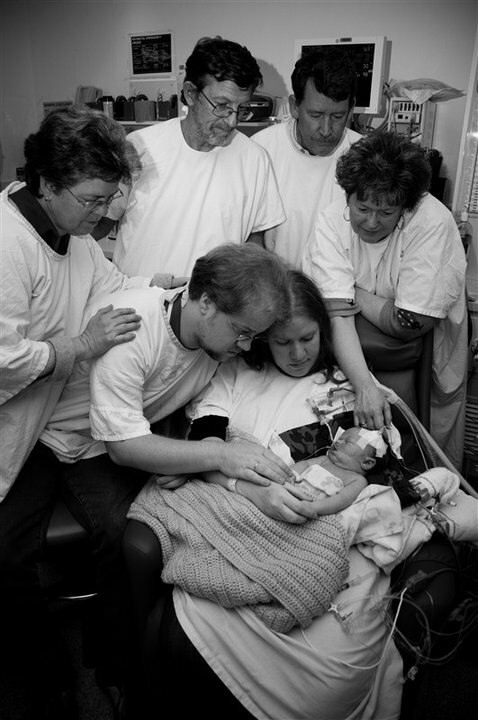 Evan was taken to the other side of the room where the second team of doctors and nurses went into action. Evan was born alive, just barely. He gasped twice and then was put on a ventilator as he couldn’t breathe on his own. His heart had to be jumpstarted and brought back to a steady pace. It took his team 3 shots of adrenaline (epinephrine), manual massaging of his heart, and who knows what else to bring our little boy back. 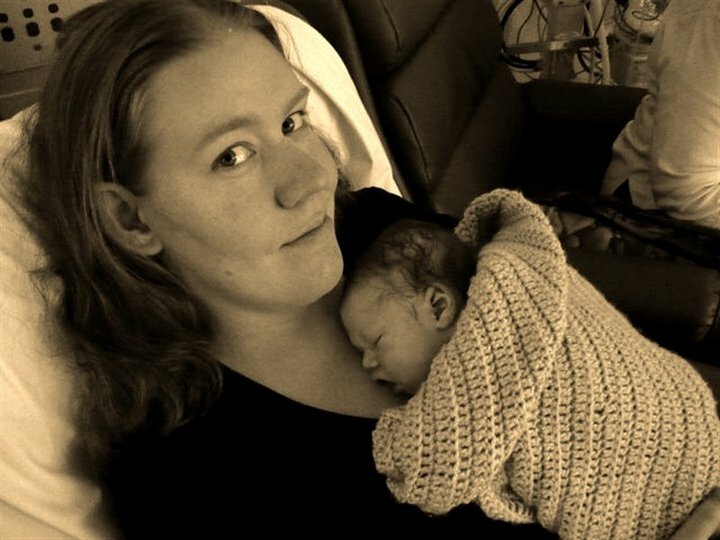 I was being given an injection to help my placenta to come out (7 minutes later) and I was definitely in shock. A ton of hot blankets and towels were wrapped around me as I was shivering uncontrollably and I was taken to my room to be stitched up. I got 3 shots of anesthetic and the laughing gas as Dr. Basu did his thing. A lady that was our liason between the ED team working on Evan and us came in and told us that Evan wasn’t doing too well. She’d let us know how he was once he was stabilized and our options. Roughly 11am Glenn whipped out his phone and sent a mass text message to anyone and everyone letting them know that baby Evan was out, was on a ventilator and we were waiting to hear back on his condition. My mother-in-law flew from work to be by our side. Our pastor arrived minutes later. I was assisted into the shower and took a long one. Some scrubs were found for me to wear (as I had shirts but no pants in my hospital bag) and we were taken to see our baby for the first time. Our first view of Evan in the Special Care Nursery of Logan Hospital. First picture with my baby son. This is not a happy smile, it's a brave face smile. Daddy changing Evan into his little warriors camo hat from Grampa Chuck. 12pm He was pretty banged up from his journey out into the world and still had all the birth gunk on him. He was hooked up to a number of machines. Some breathing for him, others regulating his medications and others that I don’t remember. We took one look at him and named him Evan Riley. Evan's name means "God is gracious", Riley means "Courageous warrior", Davies means "Beloved of God". When we chose his name many many months earlier, we didn't know the meaning. After looking the names up, it fit him perfectly. God was gracious in giving us time with our courageous warrior, who is beloved of God. 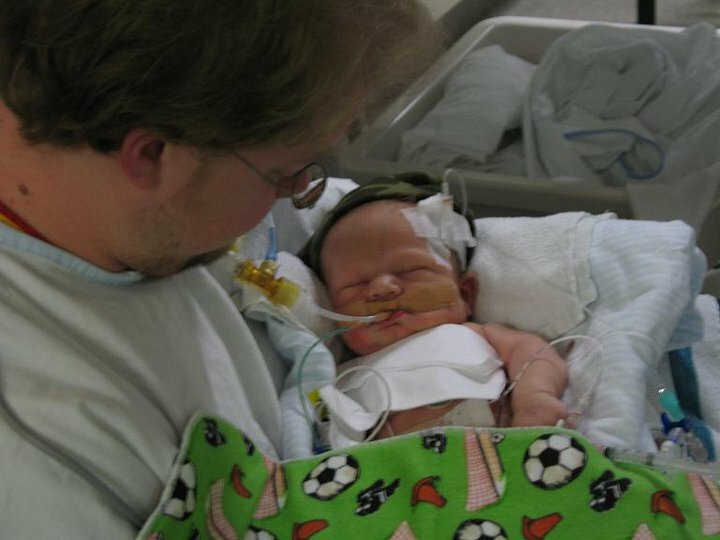 We burst into tears hearing that our baby boy was showing no signs of brain activity… that he was brain dead. 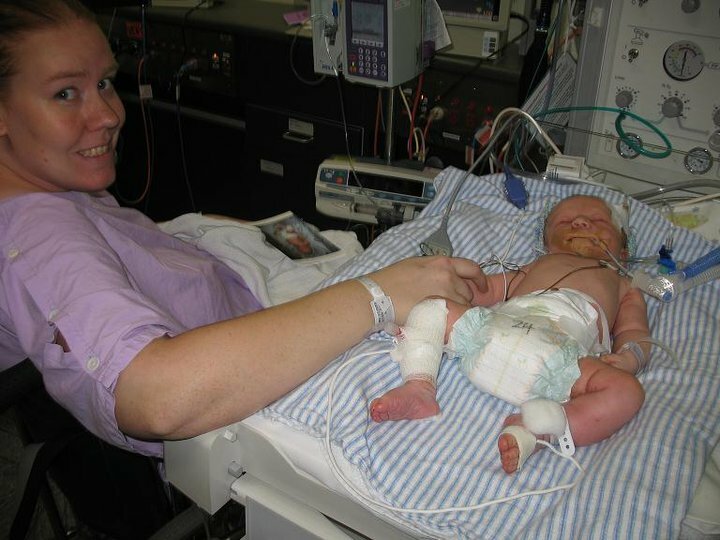 We chose not to end his life then and there, but to take him to the Royal Brisbane Women’s Hospital downtown and have him in Neonatal Intensive Care and see if they could do anything for him. While waiting for the neonatal retrieval team to arrive, we spent every second at his side. Stroking his hands and feet, taking pictures, talking to him and absorbing every detail we could. 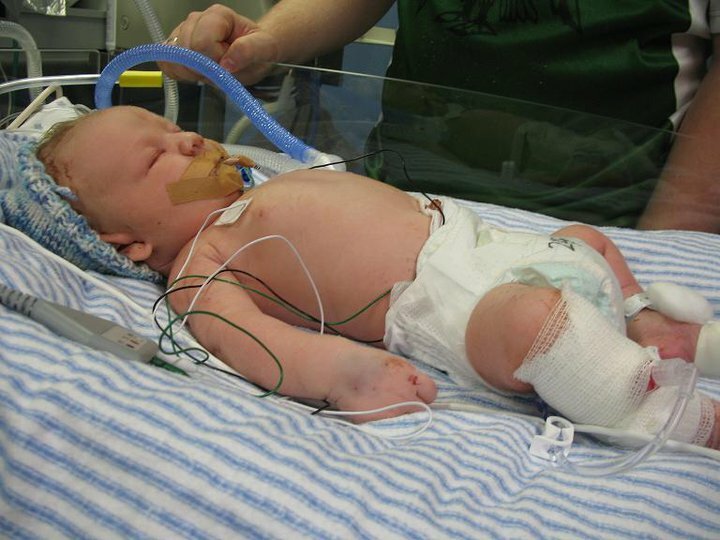 Evan was transferred from his cot to the NICU ambulance isolette and taken away. I was wheeled back to take a nap while my husband and his parents picked up clothes and my blanket from home. 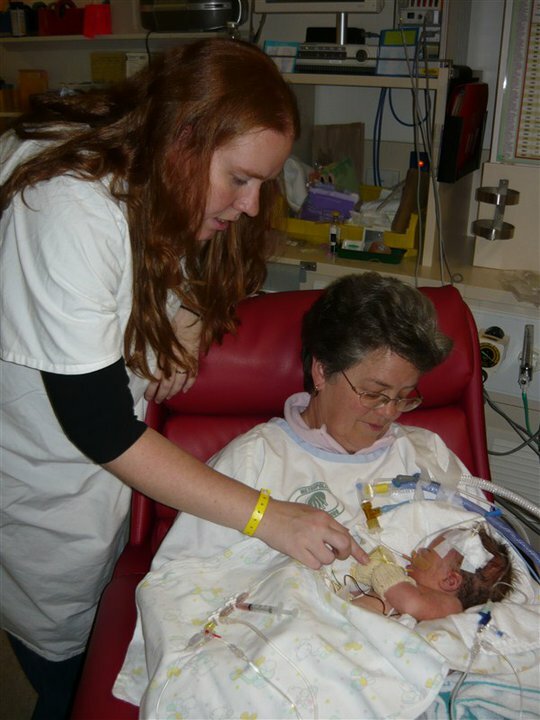 Neonatal Retrieval Team - Kate strapping Evan in for his trip to Royal Brisbane and Women's Hospital NICU ward. I just wanted my blanket. 5pm I had cried myself to sleep and slept uneasily for 2 hours and was woken up to change into my jammies by my husband. I was discharged, handed 2 packets of information (one for us, one for the next hospital) and wheeled out to my inlaw’s car, empty handed. As we were driving away from Logan Hospital I told my mother in law that "I could really use a cheeseburger". She said "No, we're going to get you admitted and to see Evan". 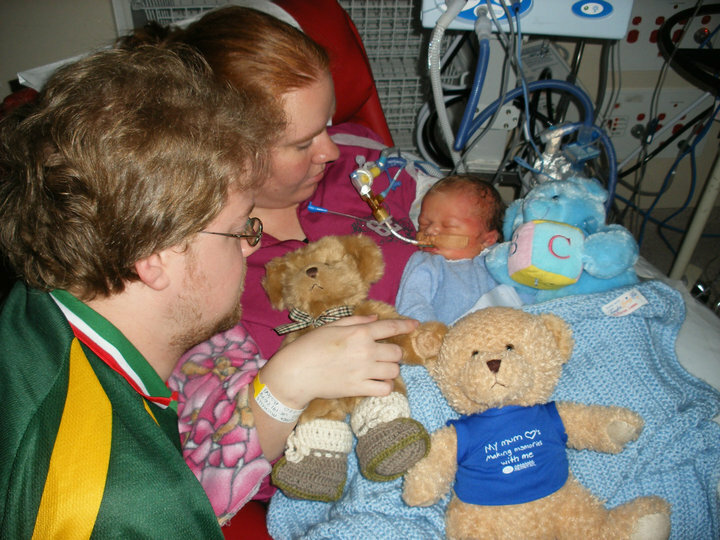 We arrived at RBWH, checked in after some confusion amongst ER staff and were taken up to the NICU to see Evan. Roughly 7pm We met his doctor who gave us the worst possible diagnosis, that Evan was brain dead. His orders were that Evan be made comfortable as much as possible and he was placed on a morphine drip. His orders that no heroics would be taken if Evan happened to crash in the night, or at any time. 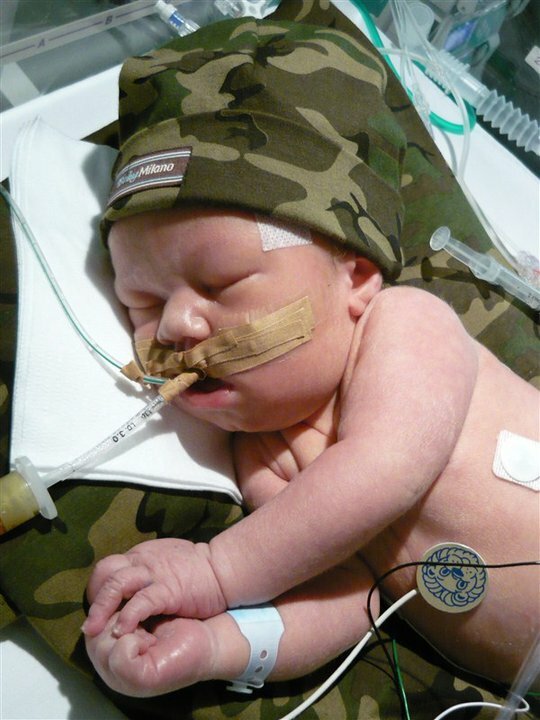 His little body had suffered the worst possible birth. We cried and I was so angry at his doctor. I wanted someone to focus my anger and energy onto, so the doc it was. Roughly 9pm We were finally able to hold Evan for the first time. I whipped off my shirt and bra and after some careful maneuvering, Evan was placed onto my chest and covered with blankets. Out came the cameras! 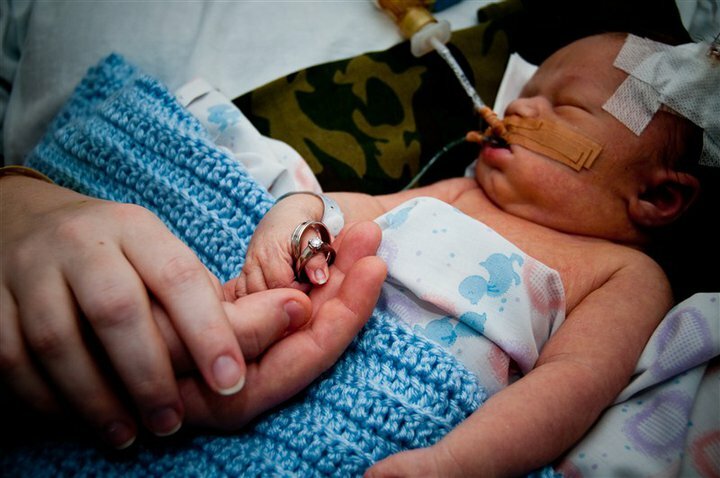 This little boy has so many photos of his short life, it’s amazing! When I couldn’t keep my eyes open any longer, Evan was taken off me and put back to bed. I was admitted and shown to my bed. The only thing that got me through that first night was knowing that my Mom would be here on Monday. When I woke up, I learned that my mom AND dad would both be here. My favorite picture of us as a family of four minus one. Evan's big sister Julia Rose was with us in memory. We had 4 days with Evan. All too short but way too long at the same time. 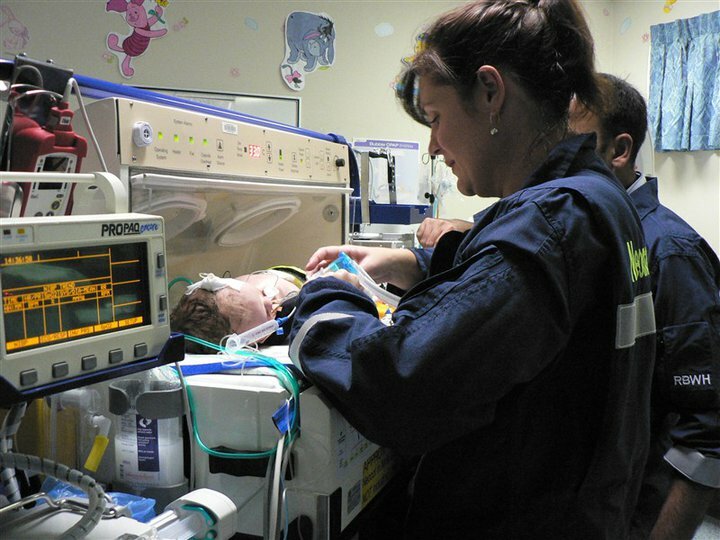 Time moves differently in the Intensive Care Nursery than it does outside the hospital. We had four days full of firsts and only's. First and only cuddles, first and only visitors, first and only diaper changes. First and only dedication by Pastor George. First and only meetings with extended relatives. My parents were climbing the walls to get down here and made it just in time. They arrived Monday June 21st at 10:30am to be with Evan for his last day on Earth. One of our pastors came and we had Evan’s baby dedication right there right away in the nursery. (Hooray for nurses that break the rules and allow more than 3 people in with us at a time!) After Dr. Davies (no relation) told my parents what Evan’s condition was and discussed options with everyone, we were asked when we’d like to take Evan off his ventilator and let him go. I couldn’t do it that night, so it was decided that the next morning (the 22nd) would be the time. June 21, 2010 Evan’s grandparents and great-grandmother were able to hold him finally and we didn’t leave his side for any more than we had to. We were moved from the nursery to a side room for more privacy. Evan’s night nurse put him into his first pair of jammies and told us we didn’t have to wear scrub gowns anymore. Glenn and I stayed with him all night taking turns holding him, sleeping with him in our arms, talking to him and crying more than we could imagine. Grandparents, Parents, Evan - June 21, 2010. Taken by Sophie Sharman, Captivated Photography and Design. Evan with Mama and Daddy's ringsJune 21, 2010. Taken by Sophie Sharman, Captivated Photography and Design. June 22, 2010 - 7am Our families arrived in the morning and once Evan’s head IV was taken out and his hair was cleaned up, his morphine and midazolin (m&ms) drips were transferred to his arterial line and I made the call to have his dosages upped at 9am. Once the nurses were sure that Evan was comfortable, we had them take his breathing tube out at 9:20am. One of the last photos of us with Evan alive. We were finally allowed to take his teddy bears and toys out of their sterile plastic bags. There was great enthusiasm in the bag ripping! 10:52am Evan died in my arms. After he was gone, we were taken out of the room so the nurses could remove his bellybutton IV line in a sterile environment. Then the nurses did his hand and footprints in plaster for us and trimmed a lock of his hair. We were in a side room talking with Evan's doctor and one of the nurses came in saying "Evan's lines are done, would you like to give him a bath now?" We hot-footed it with the grandparents back to Evan's room! We were able to take his jammies off, take his diaper off and finally give him a bath. Then we dried him off, put a fresh diaper on and dressed him in a new set of jammies and swaddled him in the blanket his Great-Gramma Larson crocheted, just for him. Once we had said goodbye (again) and I was fully discharged from the maternity ward, I wrapped him up in a blanket given to us by his auntie Ashlee and uncle David and cousin Andrew. The hardest thing in my life I have ever had to do was hand over my baby boy’s body to his nurse and walk out of the hospital empty handed… and that’s the second time I’ve left a hospital without a baby in my womb or my arms. After Evan died, he got his first full bath. Daddy was so gentle as he scrubbed the tape gunk out of Evan's hair while I held him in place. Holding my freshly bathed, diapered and dressed son. He was gone but I finally got to snuggle him as a mother is supposed to. No tubes, no wires, no nothing. Just my son dressed in warm jammies and blanket. Glenn and I with both grandmothers and the nurses that helped us usher Evan from this world to the next. I don't know how they do this day in and day out! 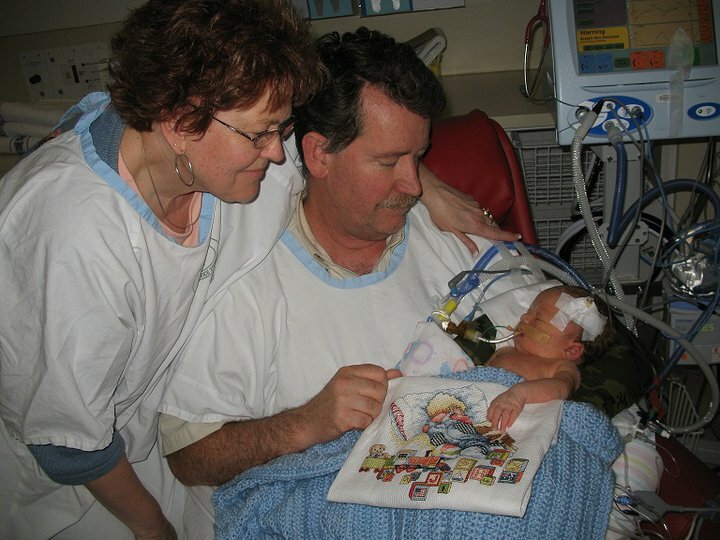 One of the last pictures taken of Evan before we left the NICU ward without him. 5pm We had dinner with my in-laws and all our extended family that night and came home to a quiet house and an empty nursery. After we had a shower and some clean pajamas, I walked into Evan’s room, I cried and cried and cried knowing that he never got to use it. Glenn and I had a long cry together and then went to bed. We slept 12 hours, and the next day saw us making plans for Evan’s burial and memorial services. No parent should have to fill out paperwork authorizing the funeral home to pick up their baby’s body to prepare him for burial. No parent should have to write their son’s death announcement for the newspaper. No parent should have to plan out their baby’s memorial service at the house of the pastor that dedicated him only days before. In the days following My church in the States flew my 3 brothers down here in time for Evan’s burial and memorial services. The older two flew out the next morning. The youngest one flew out with Dad a week later. Mom flew out a week after them. 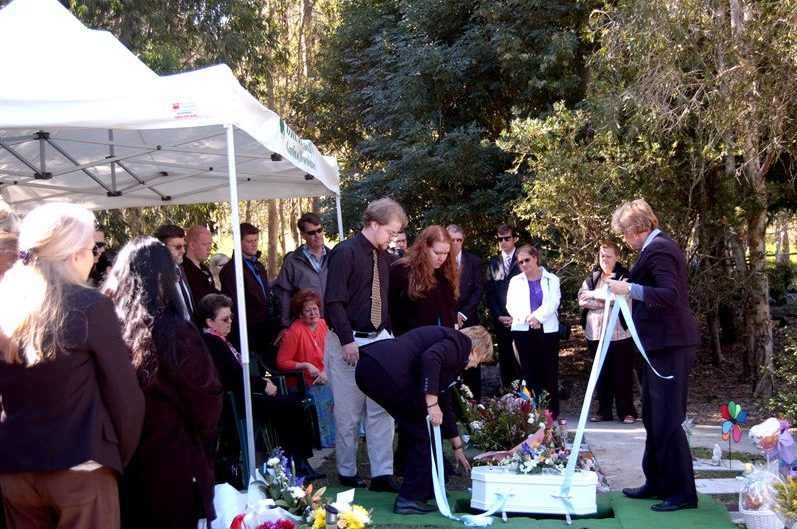 No parent should have to bury their child the day before their 3rd wedding anniversary. Yes, you read that right, the day before our 3rd wedding anniversary.